Enter the underworld to help fight crime with Jack Hammer 2 video slots. The game offers 99 action-packed betlines, filled with retro cartoon characters, a Sticky Wilds feature, regular wilds, random wilds, FREE Spins and big rewards! 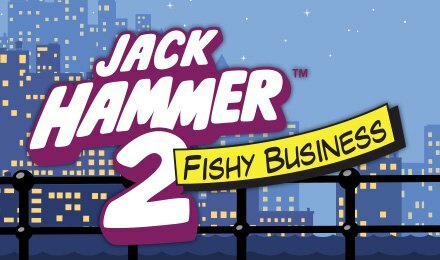 Help Jack fight crime and uncover big riches and battle through Jack Hammer 2 Slots. Jack has returned to the reels with the jaw-dropping video sequel from Netent to get stuck into some Fishy Business and fight crime over 99 Betlines. So enter the criminal underworld for a thrilling retro-style cartoon action adventure with gritty criminals and glamorous characters. Jack Hammer 2 features the super cool Sticky Wilds feature which means each symbol is spun individually. The reels are also bustling with Wild Substitutions, from regular wilds to Random Wilds that fly onto the game to multiply your wins. You should also watch out for the Free Spin symbols which can trigger extra FREE spins as you adventure to big wins!